My words tend to be dense; I often wrestle with words, shaping them to communicate Kingdom “reimagined” ideas. So I thought I should enlist help to design a picture instead. And that’s what I did. Let me share the picture then offer a few comments on how it got shaped. Stamped on the bag of rice are the words “Kingdom Rice” and an image of San Francisco fronted by the famous gates of Chinatown. 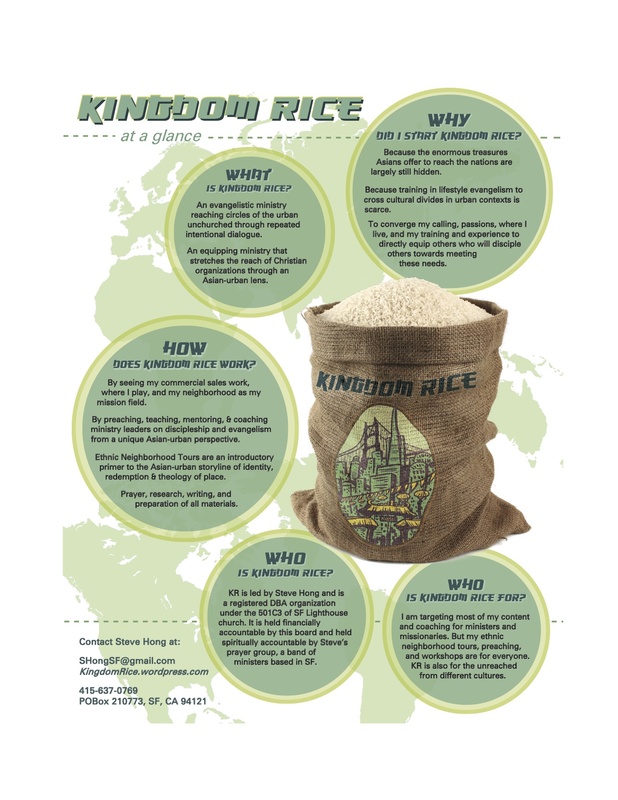 The name “Kingdom Rice” is explained here. Below the name is a picture of San Francisco, fronted by the famous gates of Chinatown. Though I never lived in Chinatown, I was born there, shopped there for groceries growing up, and married there. It’s a cultural home and provides an excellent backdrop to investigate my story and my identity. The more I know my own story, the more I’m able to cross over into other people’s stories, regardless of culture. Chinatown has also been my backdrop of choice to tell the redemptive story of God through the neighborhood’s brokenness and struggles through the years. It’s a backdrop where I can most effectively invite and challenge people to join hands with what God is already doing. To date, I’ve now challenged and invited many, many students from seminaries and people around the states and the world to step into this story, God’s redemptive story of reaching the nations through our cities. What goes on in such a tour? Read here. Iconic San Francisco landmarks are pictured right behind the gates of Chinatown on the bag. Just as knowing my own story is a bridge to loving others, understanding Chinatown bridges understanding and entering into the stories of San Francisco, and see God’s beauty in the midst of hurt and brokenness. It’s ironic that San Francisco has a horrible reputation among Christians. I’ve heard Christians bash San Francisco many times, wondering how anyone can live in such a place filled with homelessness, smells, crazy politics, and more. The fact that it’s the LGBT capital, has one of the lowest bible literacy rates, among other things, does not help. True, there is brokenness here; San Francisco is a magnet for dissidents. But on the flip side, the nations have come to places like San Francisco and that’s a primary reason why missiologists are calling cities like San Francisco the new “epicenters” of missions. In fact, I believe that if Jesus were in the flesh, walking the streets of San Francisco, he’d spend a good fraction of his time hanging and dining in the LGBT neighborhood or anywhere where dissidents are. As portrayed in the Gospel of Luke, Jesus is the compassionate Savior for everyone! And people will be drawn to His love, and people’s thirsts would be quenched in Him. That’s what happened in His day when he hung out with outcasts of his day, and we’re called to do the same here, to be his hands and feet to those who need Jesus. Personally, I am currently witnessing how God is changing hearts among people who have LGBT or other backgrounds that Christians are quick to label “abominable” actions. In as much as people in “closed countries” report how God often shows up in dreams (something foreign in our western world), I am witnessing how God shows up among addicts, people from the LGBT, and more, accepting them right where they’re at, but loving them too much for them to stay there. I know these people personally, work with them, and pray with them. I am seeing transformation before my very eyes, among the guests in my home, among those I study the Bible with in the local cafe, and more. San Francisco has huge problems, but it is also a place where God’s Kingdom is breaking through. That’s why the image has the world in the background. The equipping I do through Kingdom Rice equips lay and leaders alike to more effectively disciple and evangelize people who have very different world views than we have here in the West. Theologically, this is well taught in the Bible, especially in seminary cross-cultural programs. But these ideas are for the most part relegated to missionaries working abroad, and rarely taught in today’s Western pulpit, and even more rarely lived out. I no longer minister abroad like I used to, but I feel like I have more impact for the nations than I ever did before. For one, I’m wiser. I have now accrued a very unique experiential and educational base. Secondly, I often train missionaries on how to cross cultural divides right in their own backyards. For Youth with a Mission in San Francisco for example, I committed to teaching a 10 hour slot with the goal of connecting their overseas missions experience with normative lifestyle evangelism. With opportunities this this one and many others, God is converging my education, experience, and evangelism to effectively train disciples who are reaching and training others across the world. I’m fairly aware that my writing, and in particular my newsletters (for those of you who receive them) can sometimes be quite dense. This is true for at least several reasons. One, I’m often trying to redefine mental images that we associated with words. Why? Jesus yearns for us to experience freedom and abundance. But sometimes the words oft used to describe this abundance gets quenched by images associated with our language. For example, the word “mission” is often associated with overseas work, whereas I feel the work of missions needs to embody crossing cultural divides right where we live, and that “missions” is only for an “elite” Christian crowd verses a call for everyone. Another reason for my struggle is this: I am passionate about giving disciples of Jesus experiences and pictures of the Kingdom that are not common in Christian experience. How do you put an experience into words? Add to that, I’ve been trained and paid in my “past life” to think like an engineer. That’s why I decided I really needed a picture to describe the ministry. Sure, there are words, but the picture tells more of the story of what’s been burning in my heart, what I’m doing with Kingdom Rice, and what I am longing for. Therefore, the graphic above began with the idea that my writing is too dense. I began to pray for a picture. Enter Woody Miller, an artist (who along with his wife, is also my son’s Sunday School teacher). He caught a vision for the ministry, and was responsible for forcing me to keep my words to a minimum. That was an excruciating exercise! Thank you Woody!